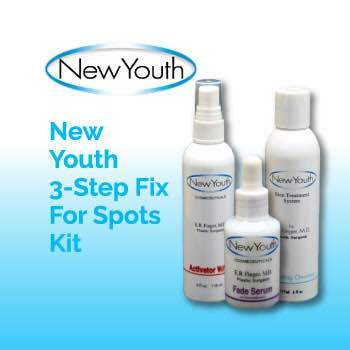 Why Use The New Youth Skin Care Spot Fix Mini Kit? For all skin types. This unique cleansing liquid provides excellent moisturization while increasing skin surface renewal. Lemon bioflavonoids and rosemary extract stimulate and tone, while the fragrant essential oils of orange, geranium and eucalyptus refresh the senses. This product thoroughly cleanses and removes excessive oil, environmental impurities, and make-up. New Youth Activator is an exclusive combination of Salicylic Acid and a special blend of extracts that will help brighten and even out pigmentation due to natural aging and environmental damage, helps reduce acne breakouts and enhance penetration of other New Youth products. Activator, provides natural proteins, botanical extracts, and minerals to keep the skin elastic and hydrated. It is also a mild exfoliant, stimulating the skin’s natural repair process of new cell growth. For all skin types. Pigmentation abnormalities, age spots, and uneven skin tone are common with aging and the sun damaged skin. Our Fade Serum is beneficial for these problems. Fade Serum is a non-prescription skin lightener with the strength that exceeds most prescription skin lighteners, but without the usual irritation and redness. It contains a combination of 2% hydroquinone, kojic acid, Morus root, and bearberry; the last two ingredients imported from the Orient. This creates an effective regulator for the skin’s pigment production as well as correcting signs of age and environmental damage. Step One: Cleanser: Apply a pea size amount with fingertips to moist skin and massage in a circular motion. Rinse well with tepid water. May be used on eye area. Step Two: Activator: Two-3 sprays on a cotton pad and scrub over cleansed face and neck. Avoid eye area. Step Three: Fade Serum: Apply 3-4 drops into the palm of your hand, rub hands together, pat Fade on the face and neck, massage into skin. Contact us for your free Skin Care Analysis! Shop online and save! 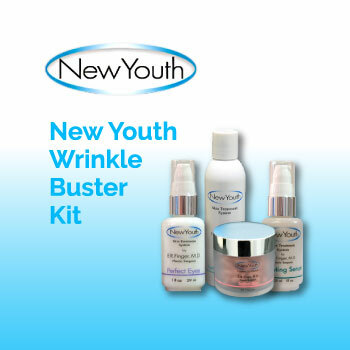 Enter coupon code decembersavings at check out and save 20% off all New Youth Skin Care for 5 Days!